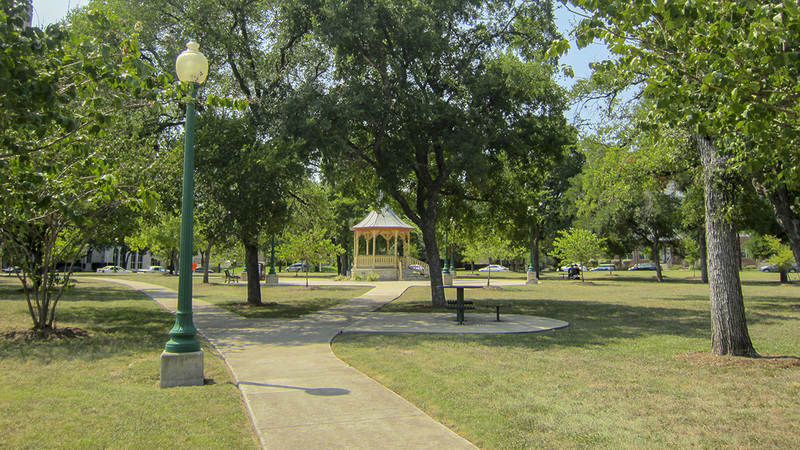 Occupying two square city blocks in the Tobin Hill neighborhood south of San Antonio College, this public space known as the “twin parks” was established in 1875 after real estate development company Gillum & Younge donated the land to the city as part of a legal settlement regarding land ownership. 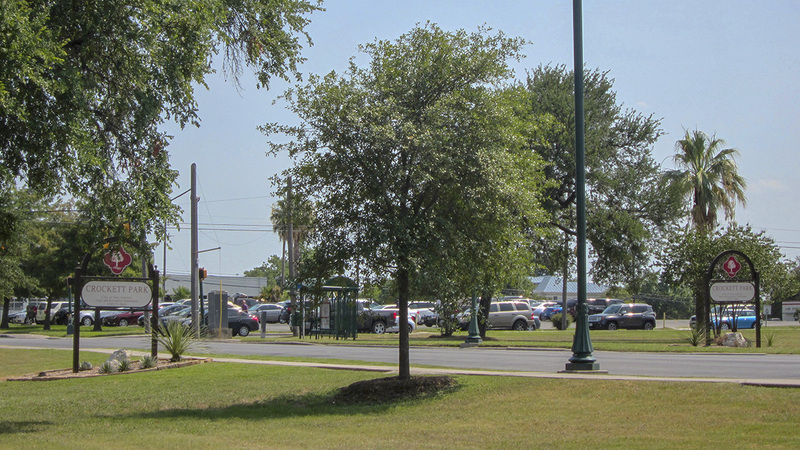 As the surrounding neighborhood developed following the introduction of the street car in 1877, local citizens petitioned city officials to make improvements to the landscape, including clearly defining park boundaries with paved walkways, roads, and streetlights. 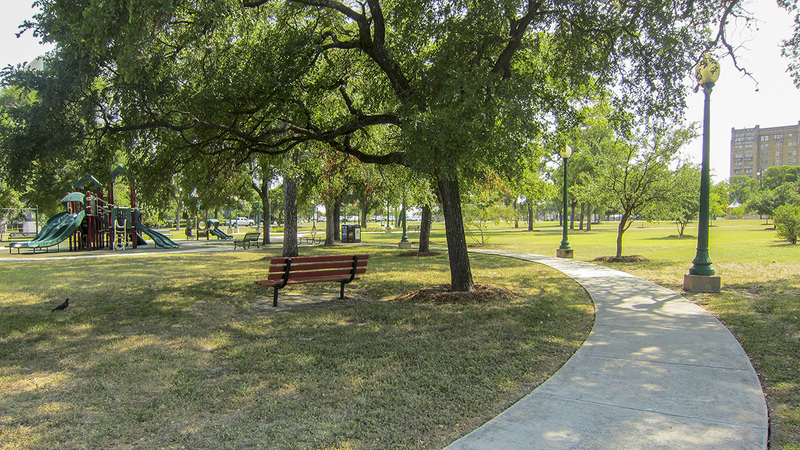 Bounded by Laurel, Ogden, Cypress, and Howard Streets and bisected by N. Main Avenue, the flat, grassy park features a wide variety of tree species. 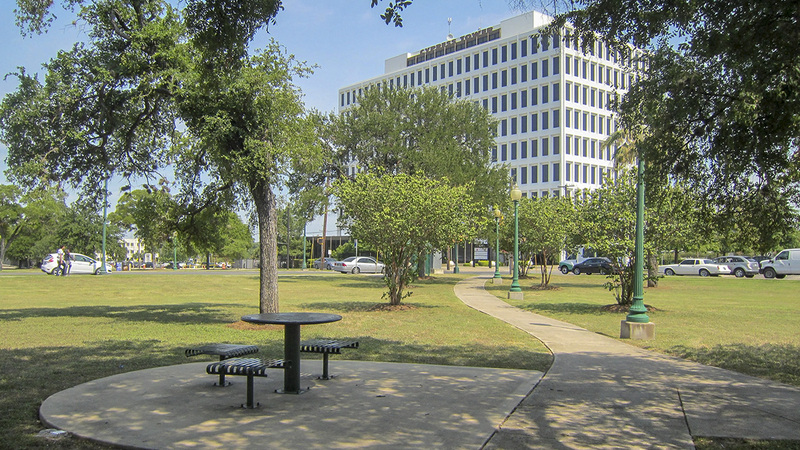 Formal concrete walkways extend from the corners (except the southwest) to the center of each of the two squares that comprise the park. 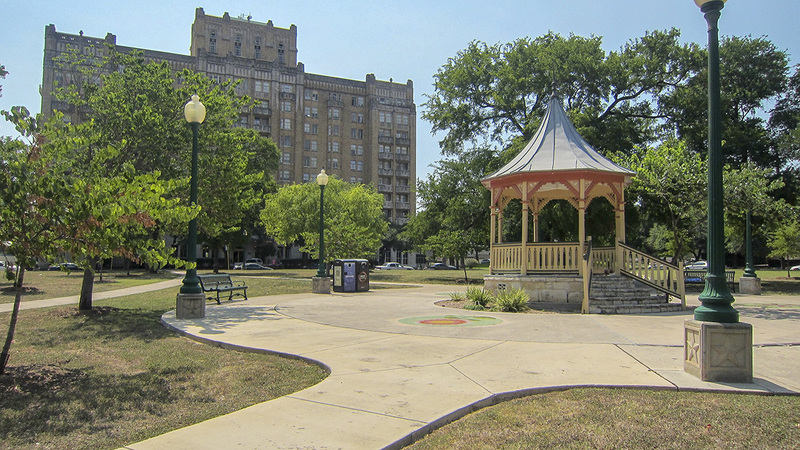 The western square contains a small, colorful gazebo at its center, while the eastern square features a playground and a central circular garden with small walkways forming the shape of a butterfly. 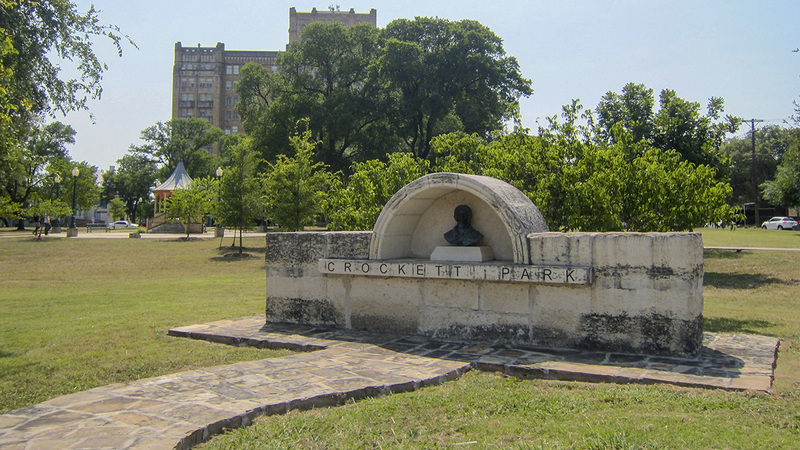 A bronze bust of Davy Crockett, American folk hero who died at the Battle of the Alamo in 1836 and from whom the park derives its name, was installed in 1989. 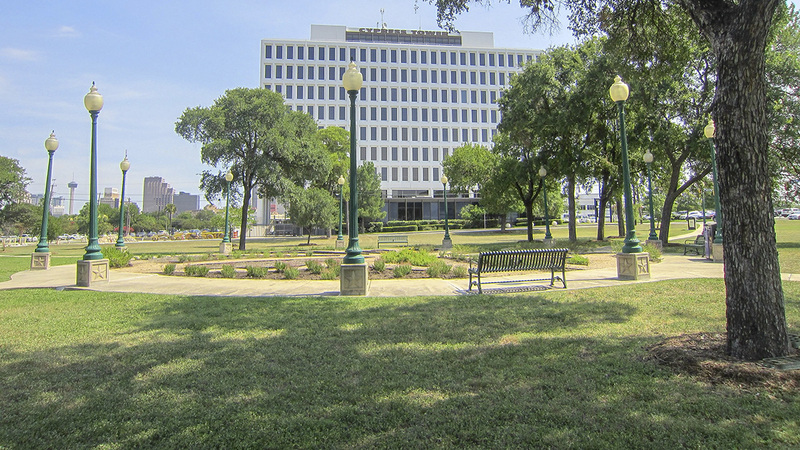 After being stolen several times from the middle of the park, the statue was relocated to the western edge of N. Main Avenue inside a rectangular stone encasement. 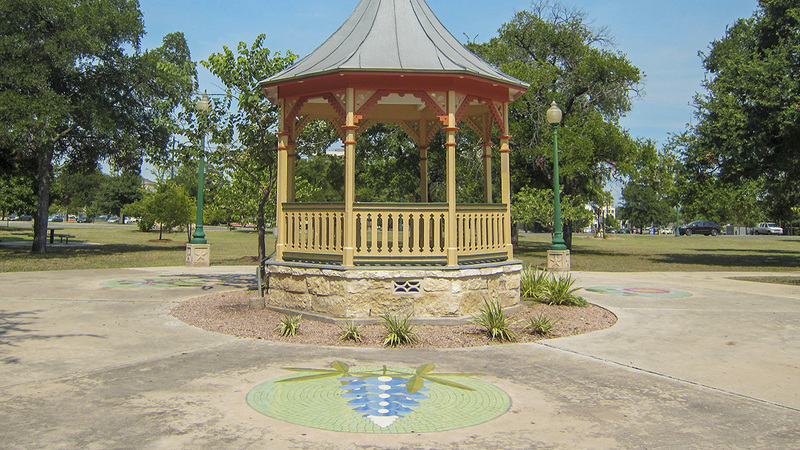 In 2007 the Tobin Hill Neighborhood Association, the San Antonio Parks Foundation, government officials, and local students collaborated to update the grounds surrounding the gazebo. The resulting cement plaza includes three round floral tile mosaics representing aspects of Davy Crockett’s life: an iris from his home state of Tennessee, a bluebonnet for his help liberating Texas, and a dahlia, representing Mexico, where he intended to immigrate.